This is one of the very first bottles of oral morphine we produced in Rwanda on November 13th, 2014. When all the calculations were done, we determined it costs about 15 cents in USD per day to achieve pain relief for a patient suffering with severe pain related to progressive incurable cancer and or HIV/AIDS. 15 cents! In many of the villages where we work in Rwanda, 15 cents is not trivial. It equals about 100 Rwandan Francs, and this is about the cost of taxi bus fare across town in Kigali. Yet 15 cents is affordable for most people; moreover, the Ministry of Health lists Morphine as an "essential medicine," indispensable to the relief of moderate to severe pain (see the WHO definition and list of Essential Medicines). That means all Rwandese citizens should be able to access to opioid analgesics when clinically indicated. For us at HWB, increasing the availability and accessibility of oral morphine in countries like Rwanda is important, because 15 cents is doable, and thus even a small organization like ours can make a difference on the ground, in the lives of individual human beings. And of course word gets around: Once people begin to experience first hand the benefit of pain control - the people themselves begin to demand access, and the pain gap begins to close! Visit our friends at Treat the Pain, to learn more! For the benefit of those we meet along the path, we must work in solidarity! 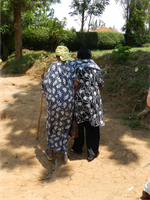 Many of our patients are widowed genocide survivors with HIV: HIV and often concomitant cancer. These are strong resilient women living under difficult circumstances; women who must work often low wage day jobs simply to survive day to day, and more often than not, this means working in pain. Of course, most of our palliative care patients lost family members to the 1994 genocide, and many more since then to illness. These people often now find themselves alone, sick themselves, suffering, and destitute. Please support our effort to insure that all people have access to pain control, and please remember what I share here: On average, a pain free day with oral morphine costs only 15 cents, and that can mean the difference between being able to get out and work and being trapped in pain and poverty. This remarkable paper from Human Rights Watch, elucidates in clear, concise, and compelling language, both the global disparity the poor face in accessing pain medication, and the simple yet powerful action we can take today, to make a difference for tomorrow. I heard about your work from your volunteer, Andrew Burgess. I volunteer as a hospital chaplain in the Portland area and look forward to coming to Olympia soon to learn more about your work in Rwanda and the hospice for the homeless in Olympia. Many blessings as this year slips away and a new year begins. We stumbled over here coming from a different website and thought I might as well check things out. I like what I see so now i am following you. Look forward to finding out about your web page again. Hello i am kavin, its my first time to commenting anyplace, when i read this article i thought i could also create comment due to this brilliant article. For most up-to-date information you have to pay a visit world wide web and on the web I found this web page as a best site for most recent updates. Remarkable! Its genuinely awesome post, I have got much clear idea on the topic of from this piece of writing.